Two of our favorite hobbies are FOOD and taking drives along the PCH. Put the two together and you have the perfect date night! Main Street in Santa Monica is a great place to experience an eclectic selection of cuisine. 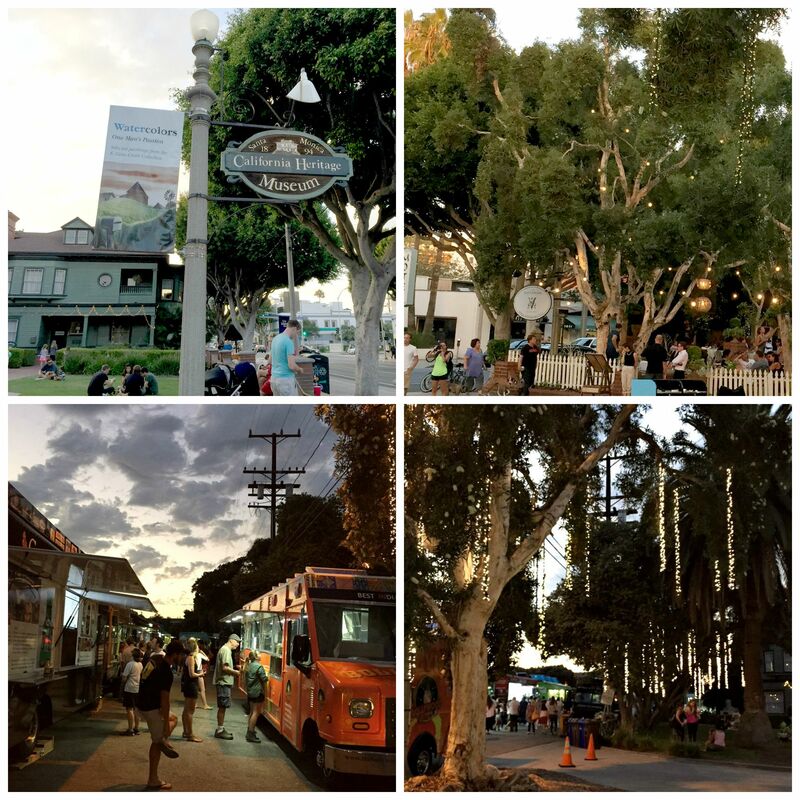 Every Tuesday 8 food trucks congregate in a parking lot on Main Street between the California Heritage Museum and The Victorian Restaurant. Savory scents of garlic, curry and grilled meats attract locals and visitors to the event. The small park next to the museum is full of families and beach goers, as well as people stopping in for a quick take home meal after work. Each week features a new group of trucks. 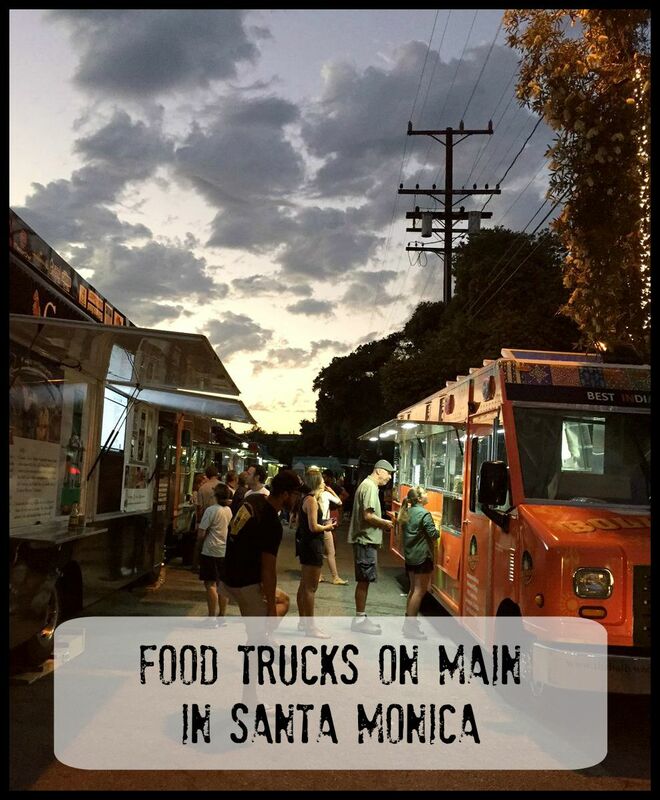 Plan ahead by checking out the Santa Monica Food Truck Facebook page for the weekly lineup. Our first stop was Postcards which features a menu inspired by American Soul Food infused with Central American spices. The owner, Greg King, lures you to his truck with his magnetic personality, big smile, and free sample of sweet potato fries and cilantro dipping sauce. Delicious! We ordered the special, Cornbread Fritter; a bed of cornbread with fresh corn, mac n’ cheese, and chicken. It was a delectable mix of flavors that sent the palate on a “tag your it” game of taste sensations that went from tamale to southern cornbread and back again. 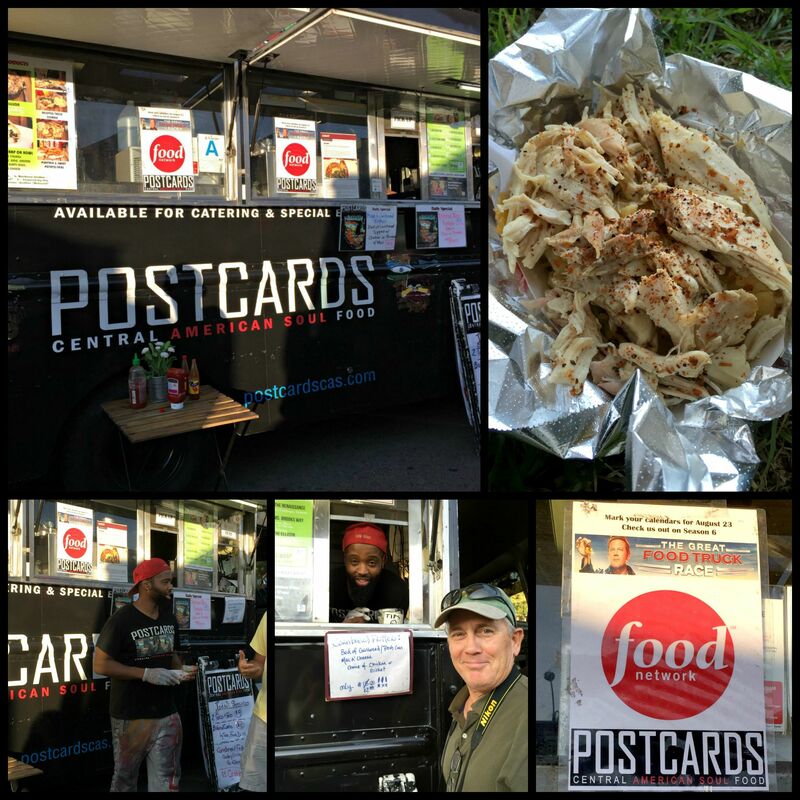 Postcards was Zagat rated in 2014 as one of the “best new food trucks on the road” and they are featured on Season 6 of the Food Network’s “The Great Food Truck Race“. They have some tough competition! You can follow them on their Facebook page. 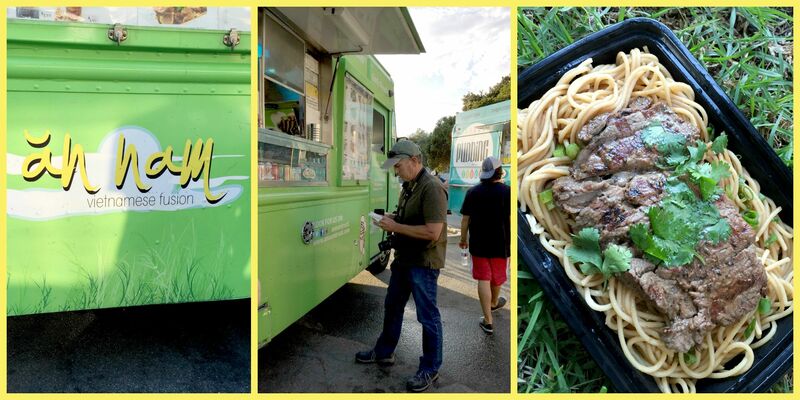 Next we followed our noses to An Nam, a truck serving up vietnamese fusion dishes. We love garlic so we settled on the garlic noodles with filet mignon. It was a great choice; very garlicky, and the filet mignon was perfectly grilled, mouth-watering and tender. 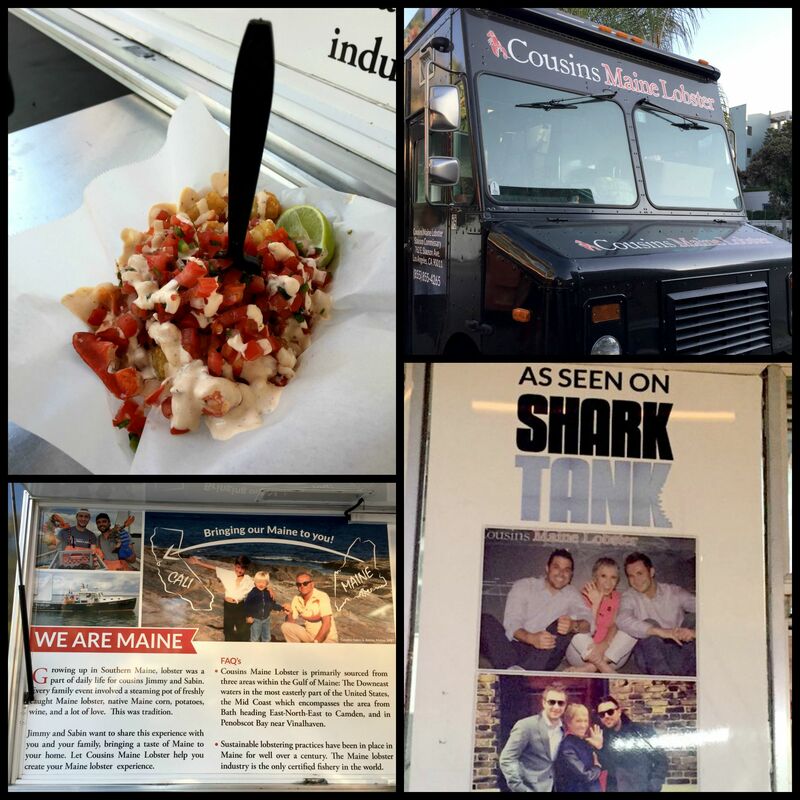 Cousins Maine Lobster features “everything lobster” from Lobster Rolls to Maine Lobster Ice Cream! I like lobster but Steve is more of a seafood eater than I am so he ordered the Lobster Tots; tater tots served with warmed lobster bites and topped with a generous portion of pico de gallo and cilantro lime sauce. This was Steve’s favorite dish of the evening. 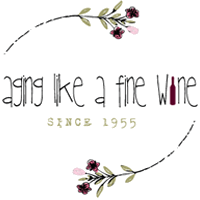 Cousins was featured on the show Shark Tank and they are now expanding their business by selling franchises all across America from California to Florida. 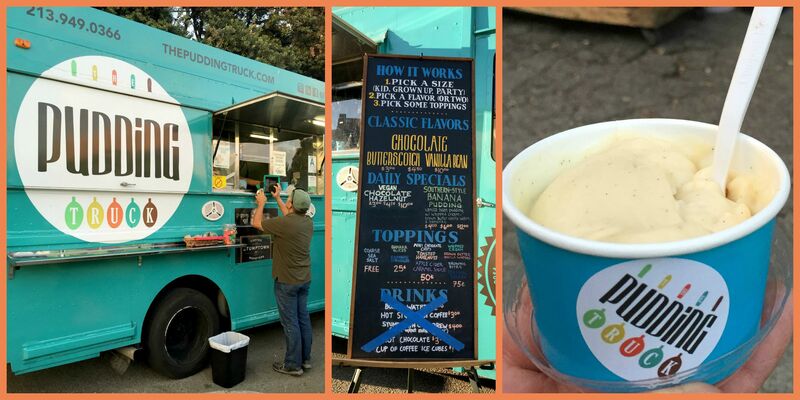 The Pudding Truck serves up sweet old fashioned pudding in lots of tempting flavors and toppings. Steve ordered the Vanilla Bean, I chose the Chocolate Hazelnut, and we took home a southern-style banana pudding with whipped cream topping for Mom. She loved it! Topping selections include sweets such as cookie wafers, brownie bites, berries, mints, sprinkles and more! This was a great way to finish off our evening meal. Sodas, juices, waters and other drinks can be bought at a stand sponsored by The Victorian Restaurant. If you’re feeling up to it and don’t have to drive home, visit The Basement Tavern at The Victorian Restaurant for cocktails after your Food Truck meal. The Basement Tavern has an eclectic atmosphere and is decorated with a fancy mix of chandeliers, sofas and chalkboard walls. The Tavern attracts a young crowd but we’re never too old to appreciate a good drink in a unique setting! 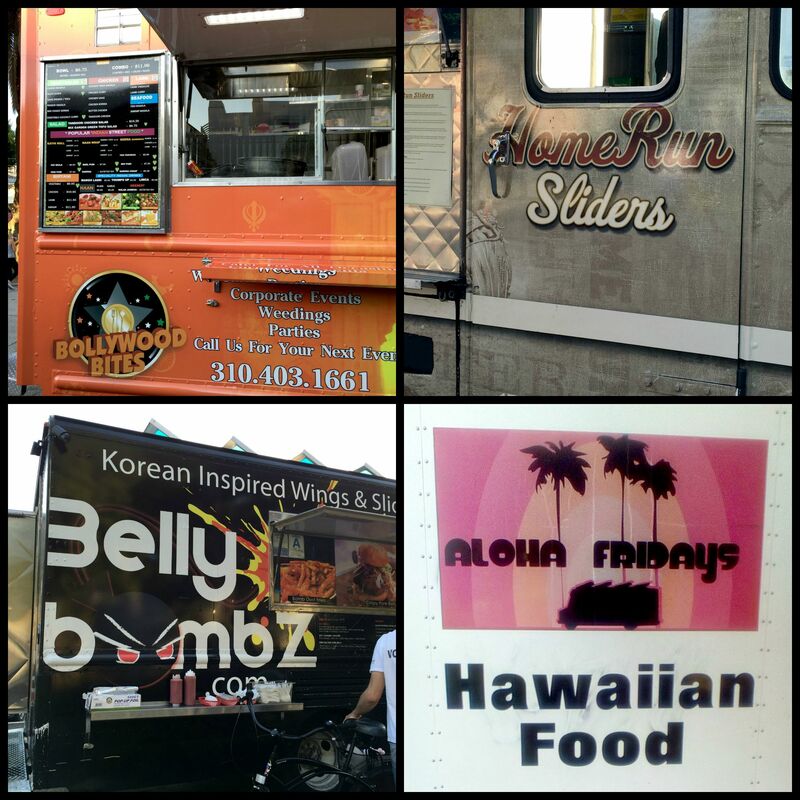 There were other trucks at the event; Bollywood Bites – mmm curry!, Home Run Sliders, Belly Bombz, and Aloha Fridays … unfortunately we didn’t have the room to taste them all! Next time we’ll take more people so we can share more delicious foods! It was just too much food for the two of us! 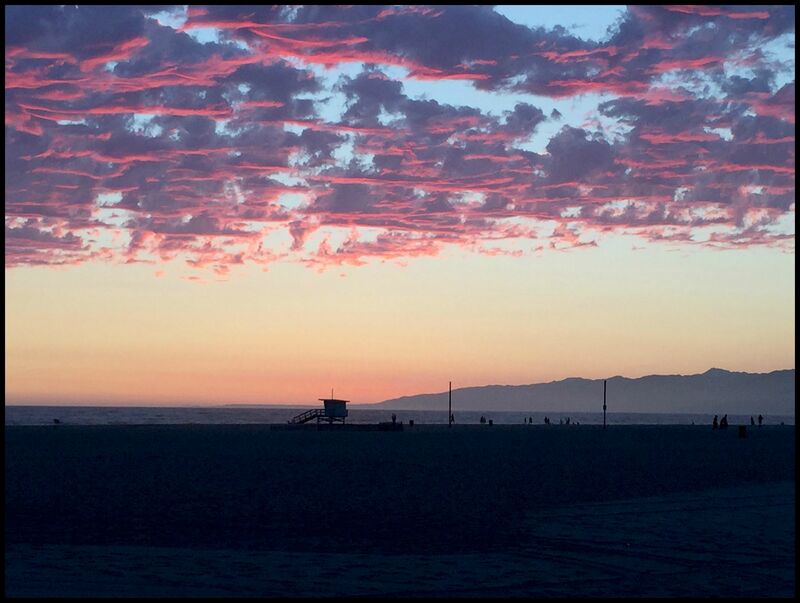 And the grand finale was the brilliant sunset over Santa Monica beach. The only thing missing was the company of my two sisters and brother-in-laws, our 4 best friends! This is a nice simple getaway. If you live near Santa Monica, you might want to make time to visit… at least once! I so wish we could go with you on a food truck adventure! I’m a big fan of the food truck race on food network! So when are you coming down so we can go together? !